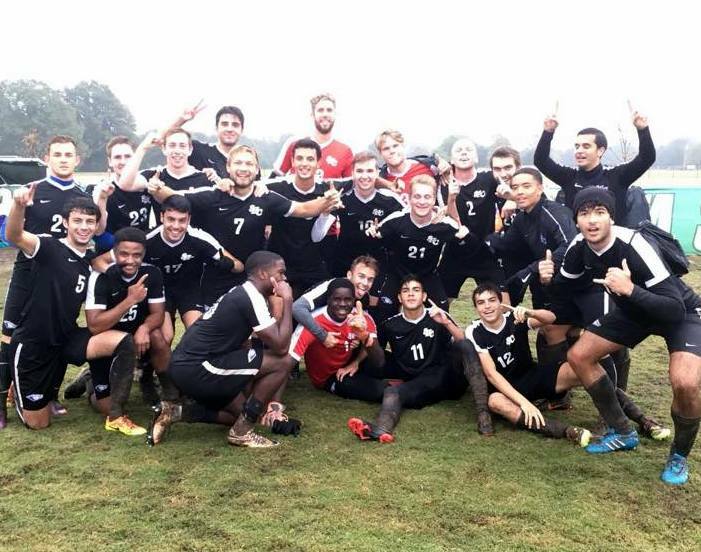 Judah Chapman and his Spring Hill Men's Soccer teammates won the Gulf South Conference regular season title by virtue of their 5-2 victory over Delta State University. With only one game remaining, SHC is guaranteed a first place finish and the top seed for the GSC tournament. Spring Hill have also earned a first round bye and some extra rest prior to the semi-finals. This marks Spring Hill’s first men's soccer regular season title on program history. Spring Hill built out a 4-1 first half lead despite extremely wet and sloppy conditions. GSC Player of the Year candidate Alex Lipinski kick started the Spring Hill offense with the first two goals of the contest. His first goal came in the 6th minute off an assist from Matt Moreno. The duo connected again just 11 minutes later when Moreno fed Lipinski for a beautiful goal between defenders. SHC kept up the attack and scored goal number 3 in the 26th minute when Jack LaForge sent home a header off a free kick from Cyril Giraud to put SHC up 3-0. Delta State scored a goal at the 30 minute mark to cut the Badger lead to 3-1. However, the Badgers could smell a championship and reasserted control when Vassil Kokali put the Badgers up 4-1 off of assists from Diogo Sousa and George Brown.